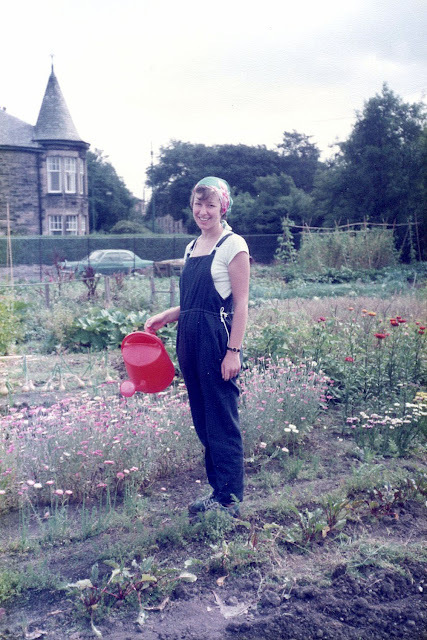 Long ago and far away, in a land of shoulder pads and big hair (1984) we had an allotment. I loved that allotment, we had been on the waiting list for so long that we only had one summer there before we moved from our flat to a house with it's own garden. The garden was low on the priority list in our new home as we spent all our time on home improvements and a year later circumstances changed and we moved to the farm. I also had a fairly extensive garden when we first moved to the farm and grew all sorts including celery and kohl rabi. When I returned to full time work, I found the garden was difficult to manage and one Easter holiday, after spending all my time digging over the ground for potatoes and I decided that I'd had enough and we put in a lawn. 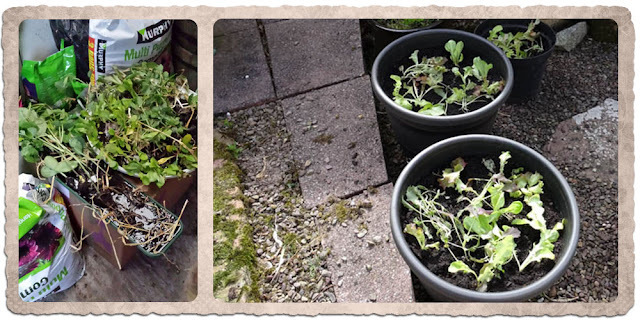 I've had a few pots or grow bags since then, mostly growing mange tout peas or courgettes. Some years they are successful, other years not. The weather is the deciding factor as we get late frosts, rain and are exposed to strong south westerly winds, so it can be a bit soul destroying sometimes. Recently, I've been thinking about creating some raised beds so that I can grow veg again, but with some control over the weeds and less digging! 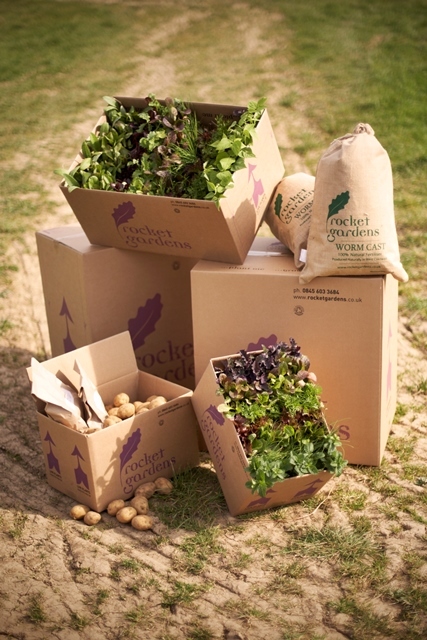 Family matters meant that didn't happen this year, but I was delighted to be contacted by Rocket Gardens to try out their neat concept of a garden in a box. 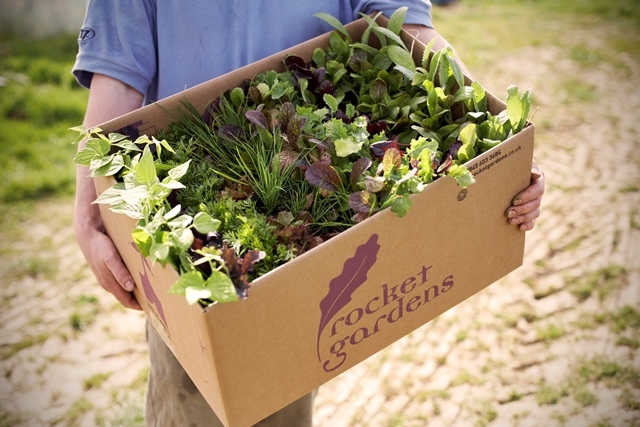 A Rocket Garden is a box full of baby plants already given the very best start in life, lovingly reared on a Cornish farm in a fully organic regime. They aren't sent to their new home until they are ready to flourish, saving time, effort and disappointment. There are a range of different types of gardens so you can select a Rocket Garden that suits your requirements and once your delivery arrives, all you have to do is pop the plants in their new home and enjoy all the organic goodies they produce. Want to grow your own, but don’t know where to start? Try the Small Vegetable Garden (£39.99). There are enough plants in this garden to seriously cut down on your weekly food bills and keep you in fresh produce from spring though until the autumn. It can be grown in a veg patch or allotment, or even in pots and containers. Know what you want to grow but nervous about giving it a go? Take all the hassle out of a gourmet kitchen garden by selecting Gourmet Vegetables (From £3.99). The plants in the range were selected because they are tasty, unusual and hard to find in shops, including Purple Sprouting Broccoli, Pak Choi, Asparagus Peas, Chinese Kale and Minipop Sweetcorn. Serious about living the good life, but want a complete solution? Try the Small Constant Garden (£199). You’ll receive a series of five deliveries during 2015 to ensure your garden is the envy of all your friends. Each delivery is packed full of organic plants that are raring to grow so you’ll have a constant supply of seasonal produce and enjoy living the good life all year long. You order your garden on the website, it's a pretty straightforward online shopping process, however it doesn't arrive until the plants are ready to be planted out. I really liked that you get lots of warning via email and a definite arrival day too. Unfortunately I had to be away from home when the plants arrived, this was a test for my husband who duly read the instructions, unpacked the plants and made sure they were well watered until I got home the next day. He did, however, jumble up all the plants and there are a lot of them! Fortunately, there is one of each plant variety labelled and I used my own knowledge to sort them out. I then planted them up in containers according to the comprehensive instructions provided with the plants, there were so many plants I had to go out and buy a few more containers. After a couple of weeks the various salad leaves were starting to really grow. The peas were happily climbing up the canes although the French Beans seemed to be in stasis! The poor little courgettes were none too happy either, none of this had anything to do with the quality of the plants but due to the unseasonal weather we have been having in Scotland. Heavy rain and northerly winds do not a happy courgette make. 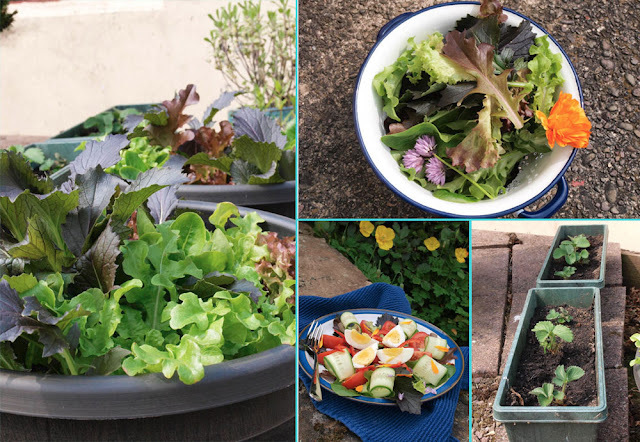 Fast forward another two weeks and the salad leaves are ready to pick, what a glorious selection of leaves which I combined with some edible flowers to create my first Rocket Gardens Salad. It was a lovely surprise when my strawberry plants arrived and I got them potted up into little troughs. 1. Arrange the leaves on two large plates alternating the different leaves. 2. Cut the cucumber into long thin slices using a mandoline, roll and place around the edge of the plates. 3. Cut the tomatoes into 1/8ths and arrange inside the circle of cucumber. 4. Finely slice the pepper and scatter the pepper slices over the centre of each plate. 4. 1/4 the eggs and place over the pepper slices in the centre of the plates. 5. Scatter petals of the chives and marigold over the salad. Serve with the dressing of your choice. Who is it for? 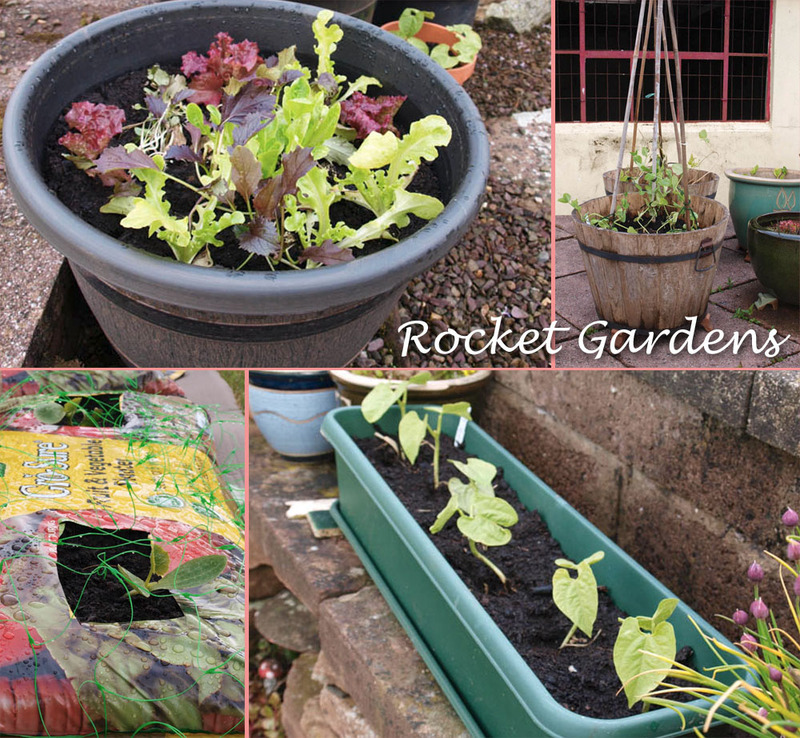 There are lots of different kinds of Rocket Gardens, so you can choose whatever is suitable for your garden. In terms of level of gardening ability then I would say that a very keen beginner or a gardener with a little experience and no space or time to grow from seed. Pros: The concept of receiving little plants in the post is not new, however Rocket Gardens have put together some really nice packages and I was impressed by the care and attention paid to communicating with their customers and the excellent instructions. Cons: With the plants being grown in the warmer climate of Cornwall, they got a bit of a shock coming to southern Scotland. I have completely lost the runner beans, the wind battered them to death, some of the French Beans have also died and only one of the courgette plants has survived. This has happened to me many times before, even when growing from seed, so I am not too surprised, but it might be a bit off putting to beginners. The Verdict: I will be ordering a Rocket Garden next year for my garden. Which garden will depend on whether I've managed to make the raised bed I have promised myself or if I will be sticking to the patio garden. 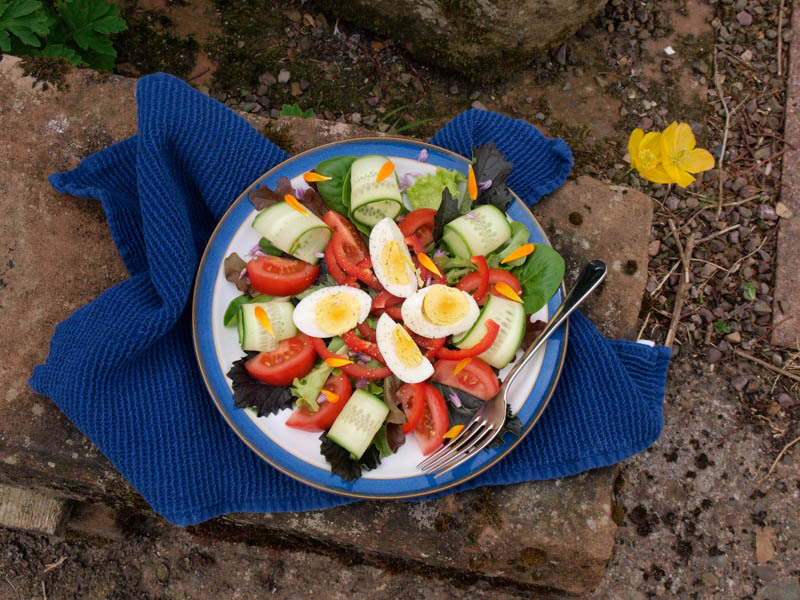 I just love having all those vegetables on my doorstep, the salad leaves have done so well that we have been able to stop buying mixed leaves and they are so much fresher and taste better too. So Rocket Gardens are a definite hit with me. I'll keep you posted as to how the other plants come along, the peas and strawberries have already begun to flower so I have high hopes for some more delicious fresh fruit and veg very soon. I was provided with a Patio Container Garden from Rocket Gardens, I was not paid for this review and all opinions are my own. oh my god I love this idea... I love the idea of growing my own but the garden is mostly flowers and I only have room for a little salad leaf so this is perfect. Love you salad too and LOVE the picture. You look so boho darling! I've genuinely wondered about Rocket Gardens - they look really good. Once I'm a bit more sorted I will try! What a cool idea. I gave up after a bad summer with my tomatoes. Mind you now I just don't have the time. Fantastic idea! I have some lettuce and rocket growing in a 'vertical salad planter' I've made from an old wooden pallet left by our builders. And now I have the perfect recipe to use the first pickings in! Thanks for sharing. What a fab photo Janice! I wish I had greener fingers but so far content to sit enjoying someone else's efforts. It's really been very easy, Fiona. I don't really have the time either Jac, but it only took an hour to pot up the plants and I've spent perhaps 15-20 minutes a week with watering and very little attention is required. Great idea to use the palette, Kate. Enjoy your salad leaves. Thanks Sarah, I love to look back at old photos. I've always loved to grow things as well as cook and eat, but there are so many things I like to do, it's hard to fit them all in. It is such a brilliant idea and would make a nice gift for a keen foodie. Fab picture of you Janice - oh to be young and in the 80s again. I love this idea and it's just what we need right now - we've hardly planted anything at all, so would be great to get a few things in that have had a head's start. Yes, they have a super gift box that comes with all the information about the plants that will arrive and how to prepare for them. Definitely a good gift. Thank you, it brings back lots of memories. Definitely giving me a head start and as time is short for me, it's an easy way to get back into vegetable gardening. Thanks Linzi, I actually made the dungarees, sewing is another thing I don't have a lot of time for now!